On holidays in Cancun? You can’t miss the Ocean Festival, an event by Delphinus, the most important forum for environmental education in the area. Now in its last days, so if you are in Cancun, you have to go. This year’s edition, its fourth, started May 14th and it will end on June the 11th. If you’re in Cancun, you can enjoy this incredible event through out these dates. 4 weeks to enjoy the Ocean Festival of the Mexican Caribbean. 12 events to participate in with your family, as a person or as a school. 2,500 visitors have participated since the Ocean Festival’s inception. The principal mision of this event is to show to the community, the importance of oceans in our lives, and how we can maximize our relation with this ecosystem through artistic, academic, recreational, gastronomic and ecologic activities. The festival’s activities are aimed at promoting the care for the environment, and to understand how the effect of our actions impact the marine ecosystem in every way. If you’re taking holidays in Cancun, you can attend the photography exhibition called “Delphinus Interior Vision” in Playa del Carmen. This exihibition will showcase the photographs of all those who participated in the “Our Dolphins” contest. In this exposition you will meet the dolphins you will swim with in Mexico. Other activities will include cientific conferences, an outdoor concert by the “Orquesta Sinfónica Esperanza Azteca”, and many more. Alas, there will be always an activity that you will be interested in. Through events like this one, Delphinus shows its support and comitment with the environment and its ongoing effort for all to understand the importance of oceans in our daily lives. 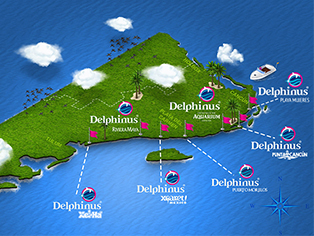 In Delphinus you will swim with dolphins in Mexico, and at the same time you will be more aware about the importance of knowing that we belong, we learn, we reflect and we can commit for a brilliant blue planet.